Ridelog — Sklar | Handmade Bicycle Frames. Mountain, Cyclocross bikes built to order. Man oh man. Betasso Preserve. This is the place that I first fell in love with mountain biking. I still remember the very first day that I rode up there on my old rockhopper and thought, "huh, this is pretty fun". Growing up in Boulder, I think there may have been many weeks where I spent more days riding Betasso than not. Ah, those were the days. It's trying to be Winter here in Bozeman, although there is definitely still a hint of fall. 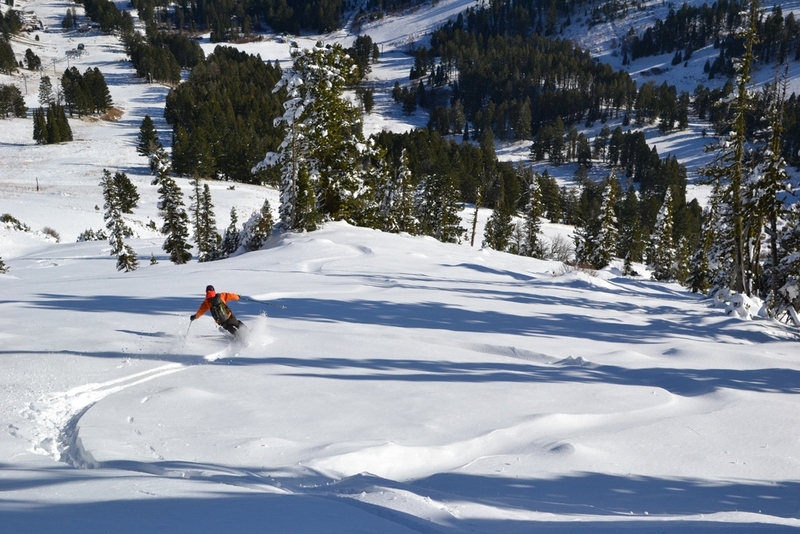 Enough snow has accumulated up in the mountains to make for some OK turns, but it is definitely early season stuff. 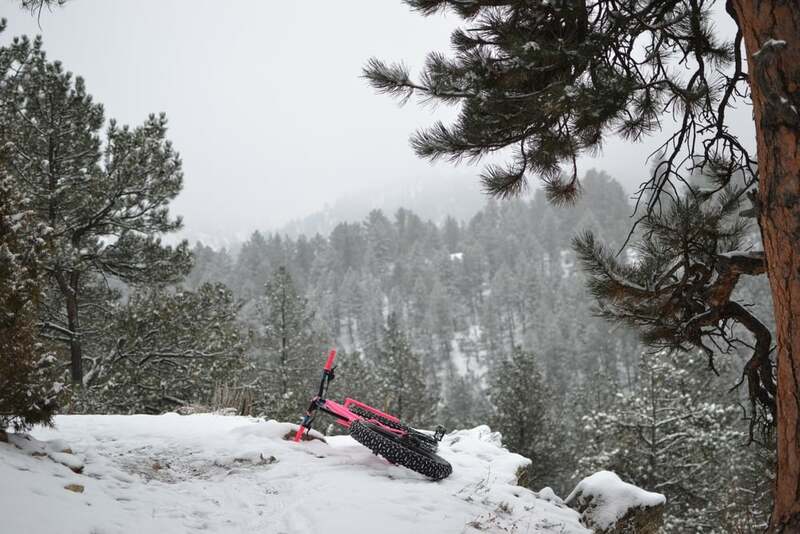 This time of year the toughest decision can be between getting excited about the upcoming season and going for a ski, or savoring the last of our time on the bike. Today, Chris and I decided to do both! This thing works so darn well that I am thinking of selling some. Let me know if interested. The Cross bike turned out to be OK though, because it happened to be a gorgeous, sunny fall day with nice dry roads. 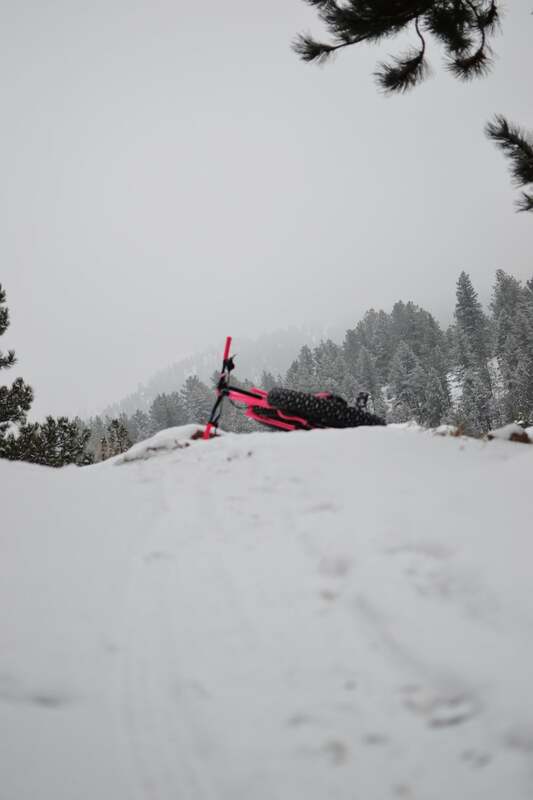 We road the 16 miles up to a top secret powder stash in the Bridger Mountains, where it conveniently was also season pass pick up day. We got our photos taken and our new passes, then got to transition to our ski boots inside. Pretty luxurious I know. From the base we ditched our bikes and threw on the skins, hiked up a good ways for some boot packing. We stopped to enjoy the scenery for a moment up top and then mad some surprisingly pleasant turns down. Lots of friends were up skiing today, so it was nice to see them in the parking lot before we booked it down the canyon and made it back home. Man, I am tired! But that was an excellent day, and a great mix of a few things I love! So I just got back from the very first ever Grinduro. I had so much fun that I thought it deserved a little write up on the blog. In case you are not familiar with the Grinduro, It is basically a combination of a gravel grinder and an enduro race. Giro cycling put this event on. It was a 60 mile loop in gorgeous Quincy, CA. This was also my fist time riding in CA, and dang was it gorgeous down there. Anyhow. The loop was split up by four timed segments. A 1 mile dirt road hill climb, a 6 mile dirt road descent, 4 miles of flatish pavement and a rippin' singletrack descent. I chose to ride my single speed cross bike which made things a bit interesting. But I am glad it was the bike I had. The overall attitude and feeling of the race was fantastic. I talked to and met so many people who were just happy to be there riding bikes. Seriously, this race was soooo much fun. Plan on seeing me there next year, and don't be surprised if more races of this format start showing up (Bozeman is the perfect place I might add). I meant to take more nice photos, but you'll have to enjoy these, or check out John's coverage over at The Radavist. Well it must have been Thursday night or so the Sam had the great idea to get some folks together for a nice ride under the stars. That coming Sunday (Or yesterday to be exact) just so happened to be a Lunar Eclipse, Super blood - moon celestial phenomenon so It was perfect. We climbed the short dirt road climb with lights out for the most part. Scattered cloud cover blocked the moon for the most part, but it's diffused light still helped to guide the way. One of the perks of riding this way is that the size of climbs aren't really visible, so we may have pushed it a bit. Anyhow. After that we bombed down some tight single track, performed emergency taco'd wheel reversal and all in all had a blast. 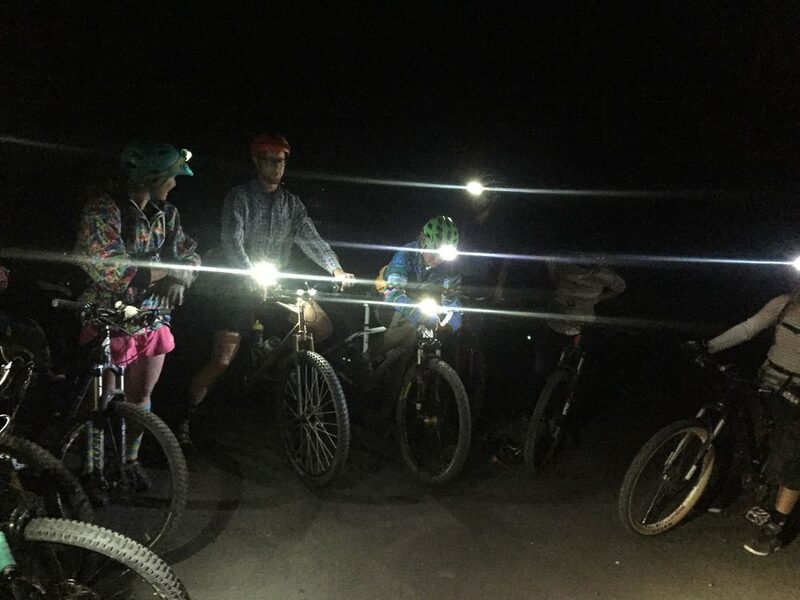 We all agreed that we need to do more night riding, because dang was that fun. Sam met me down at the shop at about 7:30 where we having the typical Friday shop happy hour (stop on by sometime! I'll pour you a beer). From there we stopped by the grocery store. I watched the bikes and handed Sam a five dollar bill. To my delight reemerged moments later with reduced price corn dogs and some happy cola gummies. Perfect dinner. The plan was to ride up to Mystic Lake via Sourdough Canyon where we would camp, make some coffee in the morning then cruise some tasty singletrack back to town. With it being nearly 8 o'clock we headed up to pick up Mike on the way out of town. We cruised up Sourdough on the nice dirt road (see last post) but it was getting dark fast. We enjoyed (Sam in particular) some shirtless riding, sipped a little whiskey, and the light was going fast. Unphased by the darkness we continued for another 3 miles or so to where we made camp. What's camping without a fire? Also note this advanced corn dog warming technique. After hanging out for a bit we hopped in our bags, layed down and fell asleep pretty quick. A full moon made it a bright night, but I slept pretty well. Upon waking, we packed up our things and started pedaling the remaining mile and a half up some dirt road and single track (reallly really fun single track) to the lake. Man, what an amazing way to start a day! 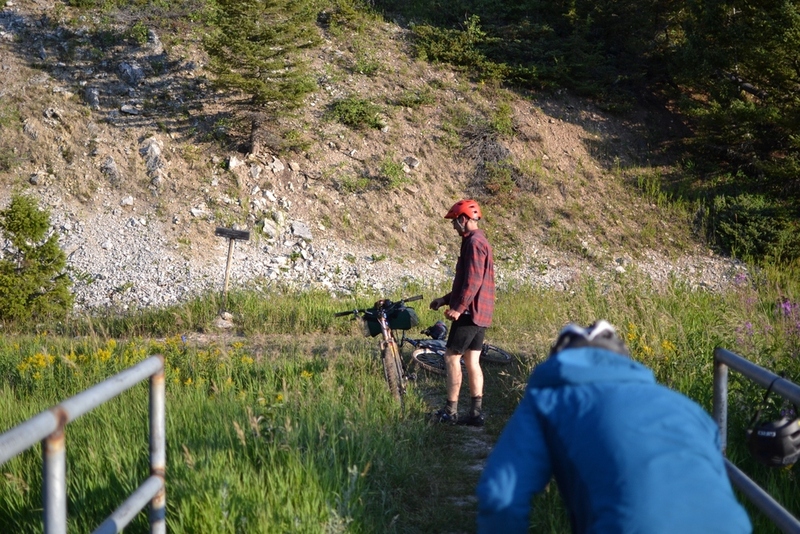 At the lake, we took a brake to make some coffee and prep for a big descent on Bozeman's infamous "Wall of Death" trail (more super fun single track). From the bottom of the single track descent were 6 more miles of dirt road with plenty of skids, jumps, oh and some nice raspberries too. Back in town we stopped by the donut shop for a snack and then made some tasty crepes for breakfast. What an awesome start to a weekend. I love how these short trips can be so low key, but at the same time just what you need to get that fix. We'll definitely be doing more for as long as we can! Some days in the shop go by so fast that I hardly have time to plan a ride. This was the case when I decided to roll up Sourdough canyon on the cross bike. I found myself at a good stopping point on Katie's frame, so I got my things together and left early for a little gravel grinding. 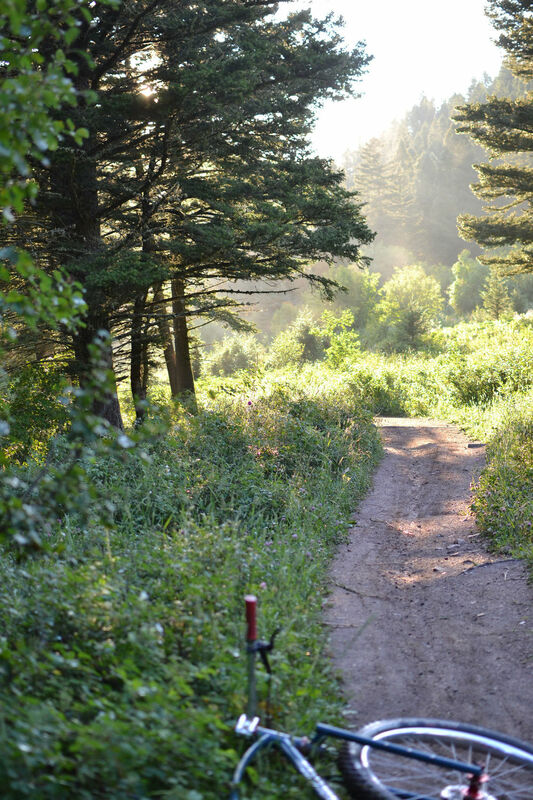 I hopped on some townie trails before getting onto sourdough road - a brief stretch of pavement - that takes you to the Bozeman Creek Trailhead. From there it is a great gravel climb up. I didn't leave until late so the light kept me from going too far. I had a nice 20-something mile ride though, and it was just what I needed. Summer in Montana is pretty awesome. Luckily I enjoy skiing too, so our 8-month Winters are bearable, but even if you weren't a skier, the quality of a Montana summer might just make it worth the wait. One of the things that makes this time so good is the fact the the sun stays out until 10pm. Last Thursday 13 hours in the shop flew by and all of a sudden I was in dire need of a ride. At 8:00 I swept up, grabbed my things and headed to South Cottonwood canyon - one of my favorite spots for some quick after work trail riding. This trail is nice because it's close to town, but I love it because of it's nice casual climb that is single speed friendly and one of those climbs that lets you forget that you are even working. The climb follows South Cottonwood Creek though nice woods and a share of open meadows. The drainage somehow seems to get more moisture than other places in the area as made apparent by the PNW-looking green foliage. If taken far enough the trail will connect up to Hyalite Canyon. 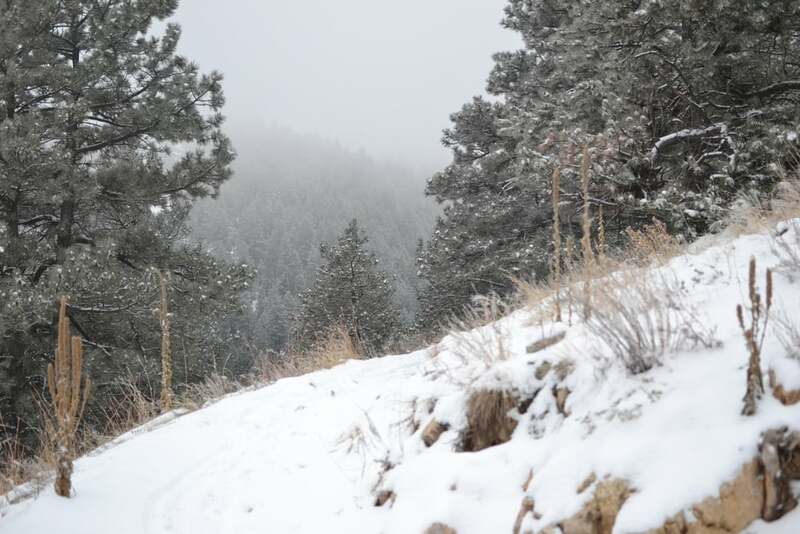 The main route also connects to another killer trail - Wheeler Gulch. Anyhow, I climbed on up, psyched to be outside after a long day. The light was making things really pretty and that just made me go faster. I had seen a moose out last time on the trail but no such sightings were made on this trip. It had been raining on and off most of the day. I threw my rain jacket in my pack on the way out the door, but I was happy to find that I did not need to use it. The rain left the bottom half of the trail perfectly tacky (Hero-status-super-tack), which was awesome. However, towards the third stream crossing (maybe 4 miles in) the puddles were getting big and I decided to turn around and not wreck the trail. That was OK though, because the light was telling me to do the same. I cruised on down one of my favorite descents. Muddy, a little tired and happy, I enjoyed a nice post-ride beverage at the trail head and called it a day. Bear Canyon sits about 10 miles East of downtown Bozeman. The trails departing the main trail head consist of a main double track, a few loops and single tracks, and many dilapidated logging roads that make up a network of passages between different canyons and peaks South of town. I texted Mike just after lunch time, realizing that I reallly needed to go on a bike ride. With little to no planning, we met up around six and decided once we were driving that we would head out to the main Bear Canyon loop and try a single track that Mike had seen on a previous ride. I had never been to the spot - but hey, adventuring and getting lost are two of my favorite reasons to go riding. For four or five miles we cruised up the trail. There was some solid climbing but lots of fun mini-descents and casual grades. Eventually we reached the top where Mike pointed out a non-descript trail off the side of the double track. It was perfect. Loamy soil, swooping turns... all the good stuff... or so it appeared.. It didn't take long for us to brake into a beautiful meadow (after navigating several downed trees) where we found the sun doing it's evening thing. I was leading this section and out of the corner of my eye I saw something move... it was a moose! Luckily just a bull, though it sat and watched us for a while before running off into the woods. We carried on through the grassy meadow as the trail grew thinner and thinner and gradually into nothing. These kinds of rides are some of my very favorite . Shredding well maintained and heavily ridden trails is one thing, but getting to explore cool areas on your bike with your friends - it doesn't get much better than that. Plus the relief of finding your way after expecting to be out past dark... well you can't put a price on that! 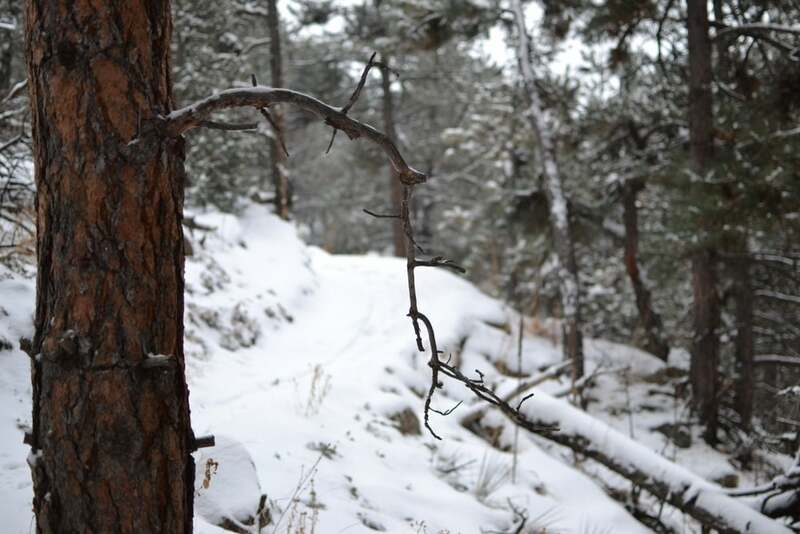 We headed up the main trail which is a nice double track through the woods. It follows the creek, which we were relieved to find kept things nice and cool on a hot day. I don't get to ride with other single speeders much here in Montana, so it was nice riding with Mike (although he is way faster than I am) mashing up the nice consistent grade. This is probably where I should mention that this trail is on the map - there should be a trail there. By the looks of it, it was logged some years ago to be never repaired and rarely ridden. Mike and I carried on though, as excited as ever, carefully pointing it down three-foot-deep grass that covered up a bed of broom handle-thick sticks left over from the long gone logging operation (perfect use for the 29+ I might add). Further on things opened up and we were able to book it through the barely visible trail which may have turned into a drainage. It was killer. This was adventure riding at it's finest. Some 1,000 feet of descending later we were back on an overgrown logging road and heading in the general direction of the car. This appeared to be an effective technique until the road split into two. We explored both options only to find two dead ends. We may have worried momentarily, however some minor investigation found that one dead end was not so dead. We took the grossly overgrown logging road and actually made it back onto the main trail, to make our way out to some more fun descending!